This report presents the results of an independent analysis of IR.94 and how it compares with multiple OTT video chat applications, including FaceTime, fring, Google Hangout, imo, ooVoo, Skype, Tango, and Viber. We conducted more than 200 tests involving different combinations of voice or video applications, test procedures, and network conditions. 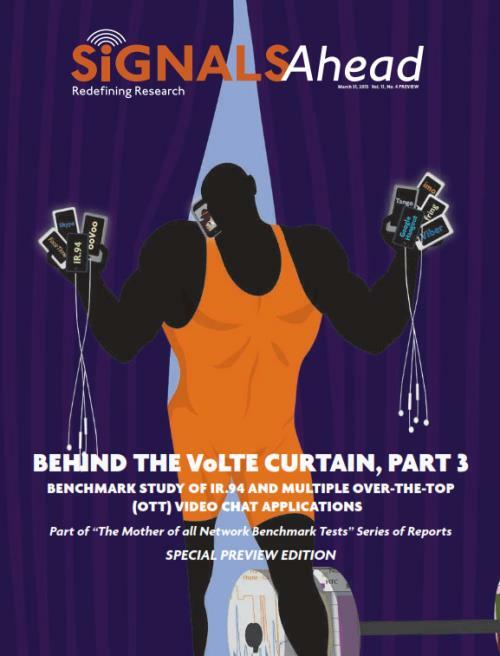 Spirent Communications provided its Chromatic test platform for the video performance analysis and its Quantum Battery Life Measurement System to measure the current drain with the voice and video telephony/chat applications that we tested. We used the Accuver XCAL drive test tool and XCAP post-processing software to evaluate the impact these applications had on the network as well as the underlying network conditions during the tests. Unlike VoLTE, the performance benefits of IR.94 are not obvious, especially when compared with Skype and FaceTime. The results also depend a lot on how the operator has implemented IR.94 and the operator has a lot of flexibility in that regard. Based on the KPIs we analyzed in our study, we give Skype the edge over FaceTime, but ironically Skype seemed to perform the best on an iPhone 6 Plus smartphone. LTE is spectrally efficient, but IR.94 consumes a lot of bandwidth, although not nearly as much as some of the OTT video chat applications. An operator will need to balance the use of a guaranteed bit rate (GBR) and QCI=2 with the impact that these IR.94 features will have on its network. IR.94 does differentiate in other ways, for example it is included as part of the native dialer on the phone. Additionally, the voice portion of the IR.94 video call uses QCI=1, thus allowing basic voice communications to continue unscathed even if the video component suffers. There is a tradeoff, however, which we discuss. Unless things change, IR.94 will remain a niche application for the foreseeable future. Operator priorities, no foreseeable support for inter-network calls and roaming, OTT competition, and the lack of support from Apple top our list of reasons. This report is included as part of a subscription to Signals Ahead or it can be purchased separately.